Andrew Byerly and Elizabeth Skiles are Todd’s 3x Great Grandparents. There’s a wonderful publication available online here that covers the Byerly Family. It’s written by siblings D. Jean Byerly Stauffer and Ted A. Byerly. I relied heavily on this document, especially for information on Elizabeth Skiles Black Byerly. Until I read this publication, I thought Skiles was Styles – it is recorded that way everywhere else. I also didn’t know when she died or who her parents were. Most places online record her death as 1826, the year she was married. Andrew Byerly was born July 28, 1784 in Pennsylvania. He was baptized at Herold’s Reformed Church in Hempfield, Westmoreland, Pennsylvania on September 18, 1784. He is the son of Jacob Byerly (who fought in the American Revolution) and Anna Elizabeth Harmon. Andrew served in the War of 1812. He was a Major in Colonel Reese Hill’s Regiment of the Pennsylvania Militia. Andrew then purchased 160 acres of land in Vermillion, Richland County, Ohio. Andrew Byerly and Elizabeth Skyles were married August 18, 1826 in Westmoreland County, Pennsylvania. (Elizabeth was the widow of James Black, who died in 1823. They had no children.) Andrew was 41 years old, and already farming and blacksmithing in Vermillion, Ohio. Elizabeth was 39. Andrew Byerly died on May 18, 1845 . His Find A Grave memorial is here. (His birth year is incorrect on the stone.) His estate was probated on April 19, 1847 and those records are available at Ancestry.com. I can’t find the family on the 1850 US Census. On the 1860 US Census, Elizabeth, age 73, lived with son Joseph, age 25 in Vermillion, Ashland County, Ohio. Nearby are son Peter and wife Elizabeth, daughter Elizabeth and husband William, and son Jacob and his wife Nancy. The document cited earlier gives an extensive account of what happened to the family land after Andrew died. Elizabeth died on April 24, 1866. She is buried next to her husband. Peter Byerly – Peter was born June 24, 1827 in Vermillion, Richland County, Ohio. He married Elizabeth Harlan on November 10, 1853. They had 2 children. Peter was a farmer and blacksmith like his father. He died on October 6, 1903 in Mifflin, Ashland County, Ohio. His Find A Grave memorial is here. Jacob Byerly – Jacob was born May 4, 1829 in Greentown, Stark County, Ohio. He married Nancy Weddell on October 12, 1848 in Ashland County, Ohio. They had 12 children. He died in 1906. His Find A Grave memorial is here. Elizabeth Byerly – Elizabeth is Todd’s 2x Great Grandmother. Read about her here. Joseph Byerly – Joseph was born in 1835 in Vermillion, Richland County, Ohio. He married Mary E. Shaffer on January 2, 1868 in Ashland County, Ohio. They had 6 children. Joseph served in the Civil War with the 114th Regiment of the Ohio Infantry. He died December 22, 1907 in Vermillion, Ashland County, Ohio. His Find A Grave memorial is here. William & Elizabeth are Todd’s great great grandparents, the parents of his great grandmother Maude Amy Davis. I don’t have a photo of William & Elizabeth, but I have photos of their children. William Davis was born December 1, 1831. His parents are Ephraim Davis and Anna McClure. Read about them here. Elizabeth Byerly was born April 17, 1831. Her parents are Andrew Byerly & Elizabeth Skiles of Pennsylvania. Andrew fought in the War of 1812. You can see his Find A Grave memorial here. Read about them here. On the 1850 US Census, there is an 18 year old William in the household with Ephraim Davis in Ashland County, Ohio. William and Elizabeth were married on April 15, 1852 in Ashland County, Ohio. On the 1860 US Census, William was 27 and Elizabeth was 28. They had 6 children: Andrew, 8; Ephraim, 6; Emrie, 5; Henry, 3; Rebecca, 1; and Amanda, 2 months. They were farming in Ashland County, Ohio. On the 1880 US Census, the family was farming in Holt County, Missouri. William and Elizabeth were 49. Henry was 23; Rebecca was 21; William was 18; Laura was 16; Joseph was 15; Margaret was 13; Marion was 12; Coraetta was 10; Minta was 9; Thurman was 7; Maude was 2. William died on September 9, 1891. His Find A Grave memorial is here. See his obituary here. On the 1900 US Census, Elizabeth was 69 years old and widowed. She’d had 15 children, and all were living. Three daughters lived at home: Rebecca Ann, 39, a servant; Laura, 35, a servant; and Estella, 26, a teacher. 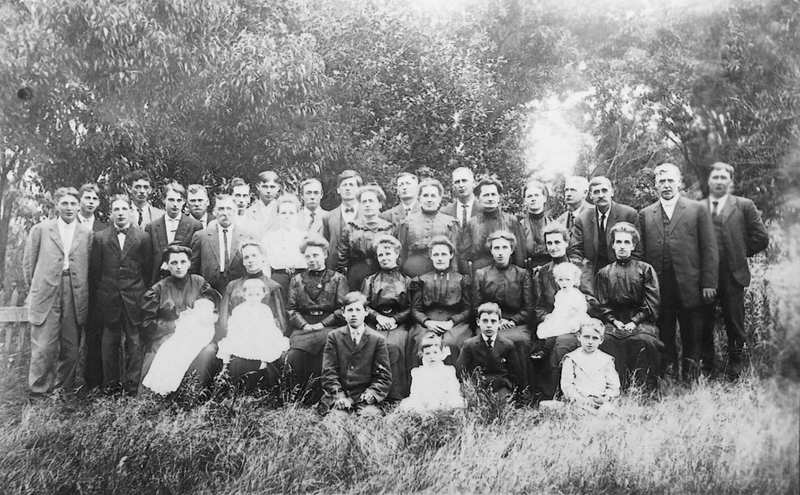 On the 1910 US Census, Elizabeth was 79, widowed, and the mother of 13 living children. She lived with daughter Maggie and her husband Lew Stouffer (farmers) and their son in Atchison County, Missouri. Elizabeth died on June 15, 1911. Her Find A Grave memorial is here. 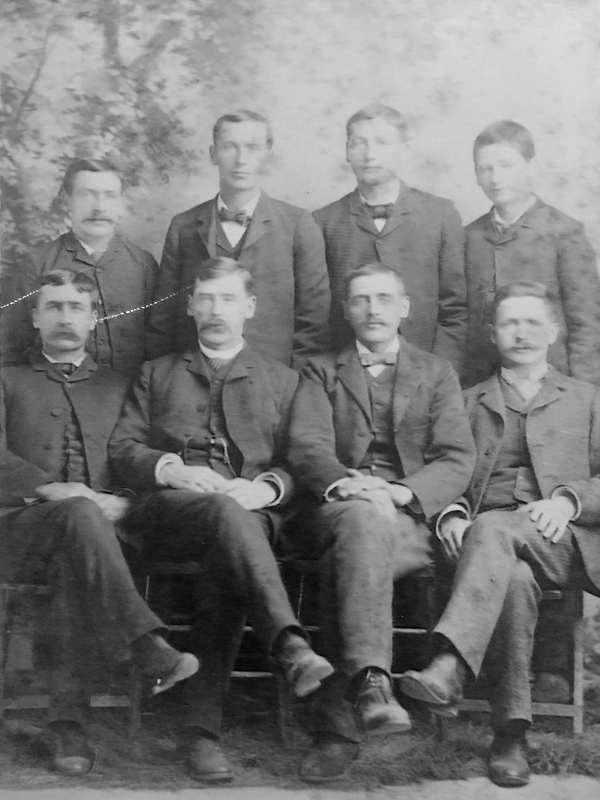 Dr. Andrew Martin Davis – Dr. Davis was born October 4, 1852 in Ashland County, Ohio. He married Emma Pettis and they had 3 children. He died on September 20, 1927 in Neosho County, Kansas. His Find A Grave memorial is here. Ephraim T. Davis – Ephraim was born January 18, 1854 in Ashland County, Ohio. He married Margaret Baker on November 21, 1880 in Holt County, Missouri, and they had 8 children. They farmed in Atchison County, Missouri. He died on February 20, 1930 in Atchison County, Missouri. His Find A Grave memorial is here. See his obituary here. Emrie L. Davis – Emrie was born on 1856 in Ashland County, Ohio. He remained in Ohio, and married Nettie Staman. They had 2 children. He worked as a merchant. He died on March 23, 1931 in 1931 in Ashland County, Ohio. His Find A Grave memorial is here. See his obituary here. Henry Milton Davis – Henry was born on May 30, 1857 in Ashland County, Ohio. He married Clara Delvina Troxel in 1883, and they had 15 children. He farmed in Holt County, Missouri. He died on November 23, 1936 in Holt County, Missouri. His Find A Grave memorial is here. Rebecca Ann Davis – Rebecca was born on October 3, 1859 in Ashland County, Ohio. She didn’t marry. She died of tuberculosis on February 13, 1910. Her Find A Grave memorial is here. Amanda Elizabeth Davis – Amanda was born on March 14, 1861 in Ashland County, Ohio. She married James Hamilton Neely in 1880 in Ohio. 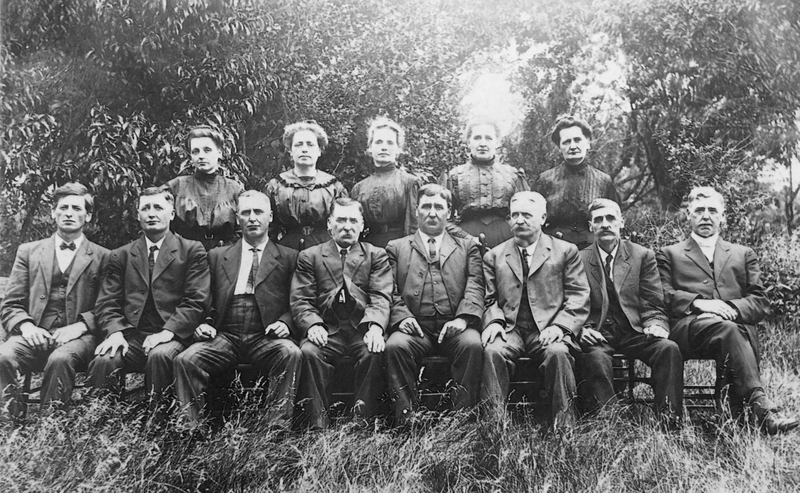 They moved to Missouri and farmed in Atchison County, and then in 1910 they moved to Montana. They had 3 children. Amanda died on January 20, 1945 in Stanford, Montana. Her Find A Grave memorial is here. William W. Davis – William was born on July 24, 1862 in Ashland County, Ohio. He married Alma Viola Wennihan in 1889 and they had 5 children. They farmed in Holt County, Missouri. William died on November 7, 1936 in Saint Joseph, Missouri. His Find A Grave memorial is here. See his obituary here. Laura Matilda Davis – Laura was born on April 5, 1864 in Ashland County, Ohio. She never married. She died on July 29, 1907. Her Find A Grave memorial is here. Joseph Franklin Davis – Joseph was born on November 2, 1865 in Ashland County, Ohio. He married Minnie Bayha in 1898 and they had no children. They farmed in Atchison County, Missouri. He died on September 27, 1933 in Fairfax, Missouri. His Find A Grave memorial is here. Margaret Charlotte Davis – Margaret was born on April 10, 1867 in Ashland County, Ohio. She married Lewis H. Stouffer in 1889. They farmed in Atchison County, Missouri, and adopted a son. She died on May 14, 1923 in Atchison County, Missouri. Her Find A Grave memorial is here. Marion Lucien Davis – Marion was born on February 6, 1869 in Ashland County, Ohio. He married Jessie Sarah Bayha in 1900 and had 3 children. They farmed in Atchison County, Missouri. He died on June 2, 1944 in Fairfax, Missouri. His Find A Grave memorial is here. See his obituary here. Cora Etta Davis – Etta was born on January 3, 1870 in Ashland County, Ohio. She married Arch Sharp in 1900 and they had 1 child. (Arch had previously been married and widowed, and had 2 children.) Etta died on March 1, 1949 in Maryville, Missouri. Her Find A Grave memorial is here. See her obituary here. 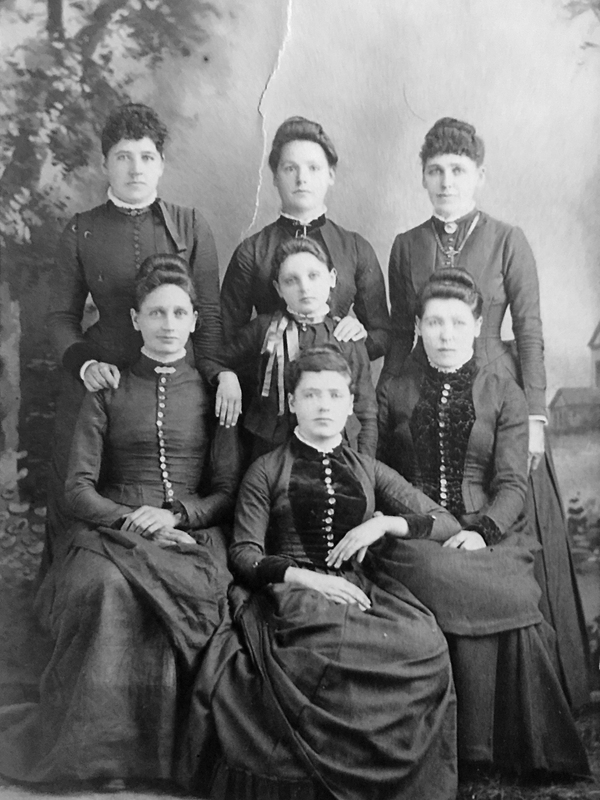 Minta Estella Davis – Estella was born on October 16, 1872 in Ashland County, Ohio. She never married, and worked as a teacher in public schools. She died on April 19, 1948 in Holt County, Missouri. Her Find A Grave memorial is here. See her obituary here. Thurman Lee Davis – Thurman was born on May 18, 1873 in Ashland County, Ohio. He married Geneva Walker in 1898 and they had 11 children. They farmed in Atchison County, Missouri. Thurman died May 23, 1964 in Fairfax, Missouri. His Find A Grave memorial is here. Maude Amy Davis – Maude is Todd’s great grandmother. You can read more about her here.